It's already July - half way through our 2012 season! 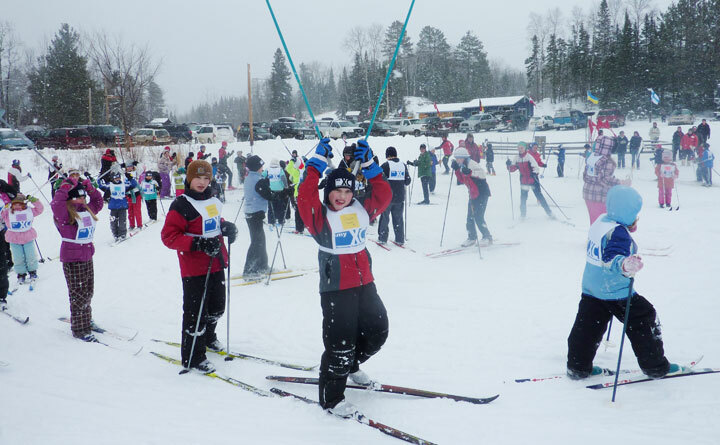 What's been happening at Moose Track Adventures an Ely MN Resort just 7 miles outside Ely MN since we opened back up in May for the 2012 season? Let's see...the inside of the lodge was completed on schedule for MN Fishing Opener weekend in May. We've had lots of compliments on the new look with lots of light and additional space to relax. The many perinnels that have been planted in the past few years have come back up along with the baskets window boxes of annuals that I plant at the cabins and around the lodge. Unfortunately, the cutworm has found it's way to Ely this spring and reaked havok on my petunias. We've had a very hot and sunny summer up to this point. Lots of time spent in the water - kayaking, tubing, floating - anything to keep cool! 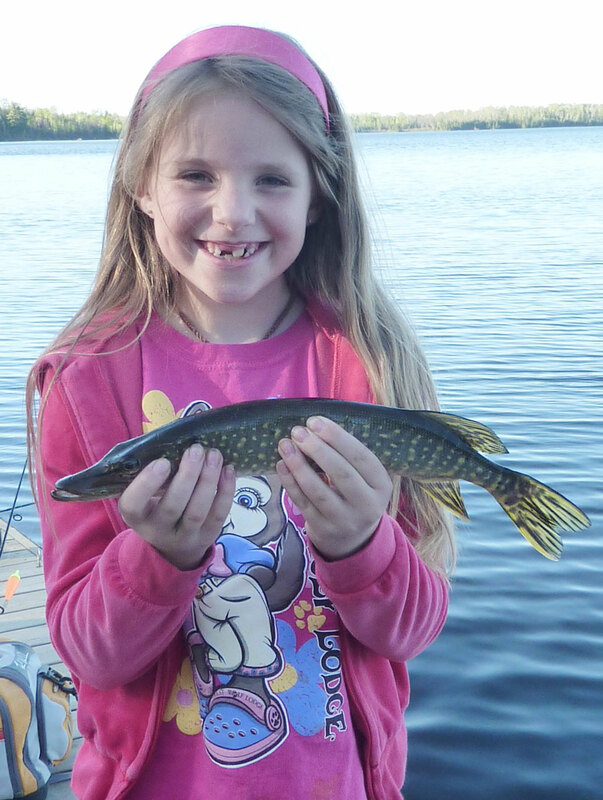 People of all ages have been to Moose Track Adventures this summer to fish - northern pike, walleyes, smallmouth bass - it all can be found in our chain of lakes right from our docks. 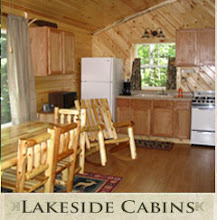 Newly remodeled lakeside cabins are still available during the remaining week of July and into August. Give us a call at 218-365-4106 to check availability! 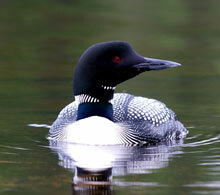 Signs of spring in Ely MN and the lodge remodel continues forward! Geese, pussywillows, and sprouting flowers - things we typically don't see in Ely Minnesota and the Boundary Waters Canoe Area in late March, but have arrived early because of our unseasonably warm temperatures this past week. 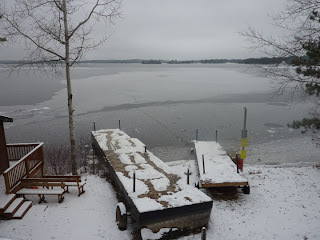 The ice is receding away from the shoreline and what was once solid white ice, has turned a few shades of grey as the top layer turns slushy and starts to honeycomb the ice. 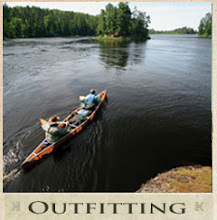 It might be a first for us, but we might just paddle a couple of canoes up the N Kawishiwi River prior to our Ely MN resort opening and go camping! This 'warm' weather has been nice to have during the lodge remodel. Easier to replace the lodge windows in 60 degree temps rather than 0, nice to be able to put the table saw outside without having to shovel a spot, and being able to open the windows to air out the poly and stain odor without running up the heat bill. Northwoodsy accents like these antler light fixtures were added in a few places to bring nature inside. Next week we will be moving on to tiling the 1200 sq ft floor. 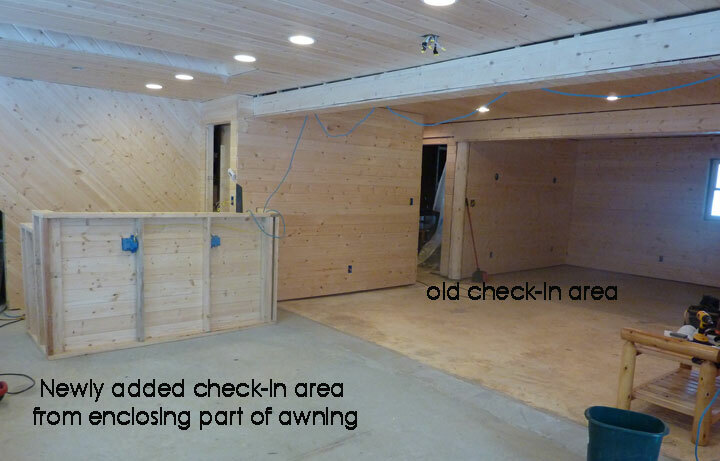 Then on to baseboards and finishing the check-in desk and we will be looking good for opening in May! Winter is still here in Ely MN in March during our lodge remodel! We might have had a few unseasonably warm days here and there in January/February of this year, but winter is still here in Ely MN just outside the Boundary Waters Canoe Area Wilderness. We've had about 10" of fresh snow in the past week and it's snowing right now. Cross country skiing conditions have been fabulous this year. 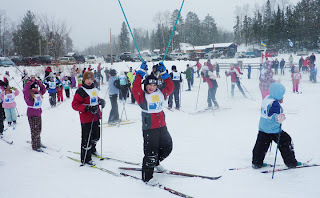 Our kids both reached the 100km goal in the MN Youth Ski League 7 week program that ended last Sunday. Lots of time was spent either at Hidden Valley, Trezona Trail around Miner's Lake or South Farm Lake on backcountry trails. 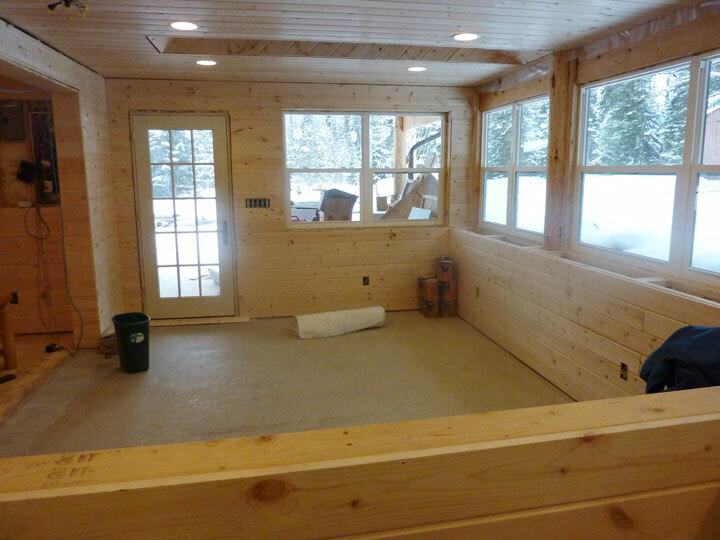 Our big project this winter at our Ely MN resort has been gutting and remodeling the entire lodge (front to back). Two years ago we enlarged the awning area outside the lodge and now we have enclosed part of it and added to our lodge space. Lots of big windows/skylights and recessed lights were installed along with pine tongue/groove on the walls/ceilings to create a warm and welcoming lodge. The wood walls/ceiling were just sprayed with polyeurathane and now we are moving on to trimming out windows/doors/walls and then on to the laying of the tile on the floor. Guests have loved our newly remodeled lakeside cabins over the past couple of years and now it's time to move on to the lodge to complete the look. Jim and I have spent many quality 'spouse' hours working together making it happen! Hope you are all having a safe and healthy winter season and we look forward to showing off our newly remodeled lodge in a few months. 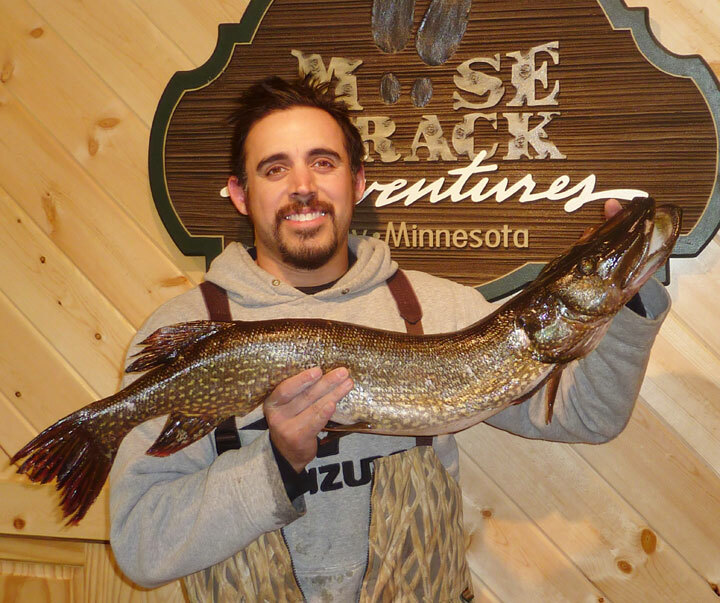 Don't forget MN Fishing Opener is May 12, 2012 - call 218-365-4106 to reserve your cabin on Farm Lake today! Winter is back! It's that time of the year when the temperature dips down in the low teen digits at night and ice is being made. When and how do lakes freeze over? Now that it's too cold to swim in our lakes, we can look forward to the next great lake season – winter sports! Bring on the cold and snow so we can ski, skate, snowshoe, ice fish and snowmobile. This week, I noticed that some small ponds have a thin layer of ice on them. This prompted me to think about when and how our lakes freeze over in this area. As you all know, water freezes at 32 degrees Fahrenheit. That doesn't mean, however, when the air temp reaches 32 the lakes freeze. Water is a great insulator and good at holding heat, which is why the lake temperature doesn't fluctuate much day to day like the air does. Therefore, below freezing temperatures are needed for a week or more to form ice on a large lake. As I have mentioned before, water is a unique substance in that the solid form (ice) is lighter than the liquid form (water). For most substances, the solid form is heavier. Our lives would be much different if ice sank instead of floated. If ice sank, lakes would freeze from the bottom up and the fish and other aquatic creatures wouldn't survive the winter! Since water is good at holding heat, the more water there is, the more heat it will hold. This is why large deep lakes take longer freeze and melt than small shallow lakes. Water freezes from the perimeter of the lake to the center. 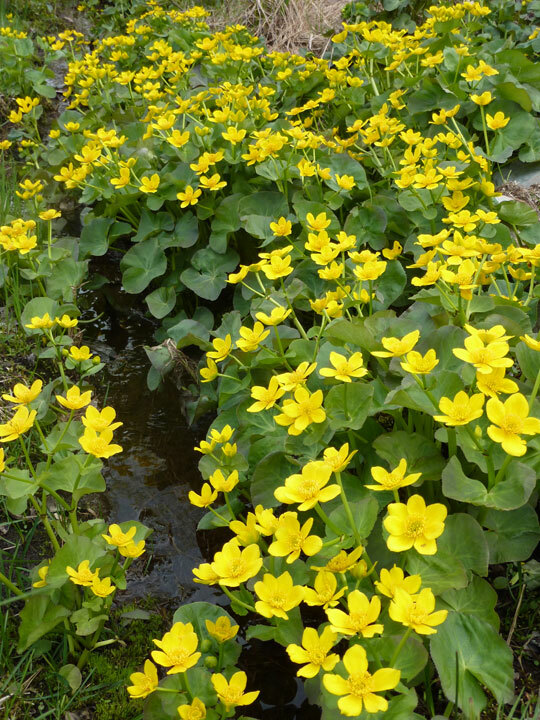 It happens this way because the water is shallower at the lake's edge so it cools off faster. Water is most dense at 39 degrees Fahrenheit, so when it gets colder than that, the cold, lighter water floats on top of the lake. This top layer of water interfaces with the cold air, which cools the top of the lake even further until it freezes. Windy days cool the lake surface off faster because the cold air moving over the water cools the lake faster. Since ice-in does not occur in one day like ice-out usually does, it is hard to keep accurate records. The ice can form around the edge of the lake, and then a warm sunny day can come along and melt it again. The picture above shows the main dock outside the lodge at Moose Track Adventures an Ely MN Resort just 7 miles outside of town. We pull the pieces of the 'T' dock out of the water as much as we can so that come ice out in April the huge sheets of ice blowing around don't mangle it to pieces. With the old crib dock that this replaced, every April we had to set aside a week to 'rebuild' what the ice sheets/chunks damaged. Here we are a month since our last post - the lakeside cabins have had their spring cleaning, the remaining fall leaves raked and taken away, the boats/motors are in the water - we are opened for the 2011 season! 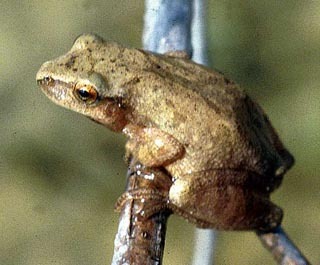 and the spring peepers can be heard in the evening. The 2011 MN Fishing Opener was also today - gust up to 25mph winds made it a bit challenging for our fishing guest today, but they managed to bring a few fish for dinner! 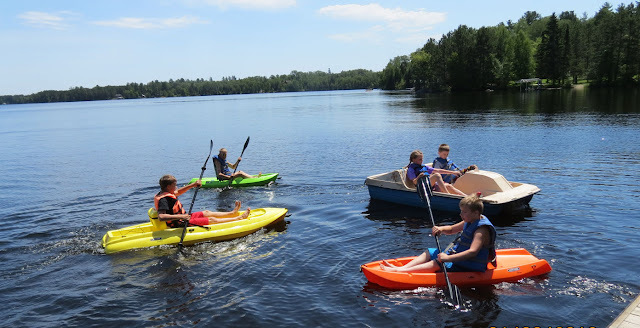 We still have a few cabins available at our Ely MN Resort for nightly rental in the month of May - just $110 a night (minimum 4 night rental) for a lakeside cabin or $135 a night (minimum of 4 night rental) for a lakeside cabin and a 14' boat/15hp motor (boat gas additional). A few evenings ago we were treated to an unusual sound that Joan and the kids could not figure out what was making it. Joan called me on the cell phone and asked me to stop at the top of the driveway to figure out what was making the “beeping” noise. When I got out of the truck I knew exactly what was making the usual beeping sound, a Saw Whet Owl. For those of you who have never heard one they sound like the warning sound of a truck backing up in reverse. A small owl of all types of woodlands, the Northern Saw-whet Owl can be found roosting in winter in small, dense conifer trees, sometimes even in parks and gardens. Its defense upon discovery is to sit still and not fly, leading people to perceive them as "tame." • Face white, outlined in brown and white. • Under parts white streaked with brown. Upperparts completely dark brown, under parts bright buff. White Y on face, made up of eyebrows and white mark between eyes. Lacks white spots on back. 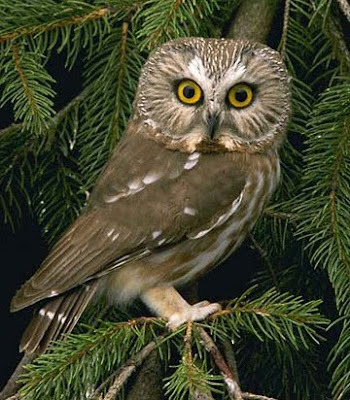 • The main prey items of the Northern Saw-whet Owl are mice, and especially deer mice of the genus Peromyscus. Adult mice usually are eaten in pieces in two different meals. One owl was found dead after apparently trying to swallow a large mouse whole. • The female Northern Saw-whet Owl does the incubation and brooding. The male brings all her food while she is incubating. She leaves the eggs for only one or two short trips each night, to defecate and cough up a pellet. • While the female saw-whet broods her nestlings, she keeps the nest cavity very clean. But, when the young are about 18 days old, she starts spending the night in another hole, and then the dirt starts to accumulate. When the young owls leave the nest after another ten days to two weeks, the nest cavity has a thick layer of feces, pellets, and rotting prey parts. OK, you've found the Crappie, now let's look at some effective techniques to get them on the ice! Another jigging technique made popular by the pro ice fisherman Dave Genz is pounding the jig. Pounding a jig is basically jiggling your rod tip up and down just an inch or two very quickly. This is one of my favorite techniques and seems to entice those sometimes finicky Crappie. If you're not using a flasher and have no idea what depth the fish are at, start by jigging near the bottom. If you don't find fish, come up a foot or two. Continue the process until you either find fish or reach the ice with your lure. Now that you've got the hang of jigging, let’s look at the lure/bait you're using. There are several jigs that have proved effective over time. Be willing to experiment with any of the jigs pictured below. Vertical Jigs with a minnow are usually used more during changing light conditions and at night. Horizontal Jigs with grubs are usually more effective during the day. Using live bait is important to trigger a bite. Tip your jig with a live minnow, minnow head, or a grub. In most places while ice fishing you're allowed more than one rod. 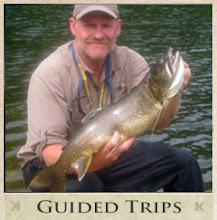 I usually set up a second rod with a float (bobber) and a lively minnow on a hook or a jig while ice fishing for Crappie. Finally, Crappie are also called Paper Mouths for a reason. Their mouth rips pretty easily so when you get a bite don't set the hook too hard. Hopefully you've found something new to try in these Crappie ice fishing tips and techniques that will help you ice more fish. 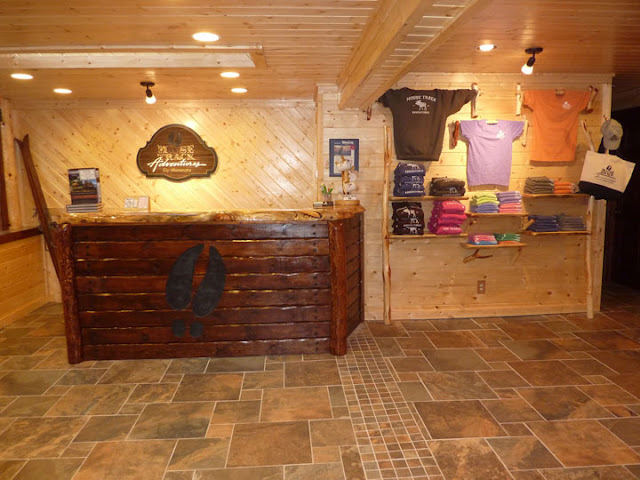 Rated #1 as an Ely Minnesota Resort - Moose Track Adventures is a family operated Lodge, Boundary Waters Outfitter and, Guide Service in Ely, Minnesota on the edge of the Boundary Waters Canoe Area Wilderness. We offer lakeside cabins rentals, canoe outfitting for the BWCAW and a variety of guided canoe trips, fishing trips, and eco-tourism trips.